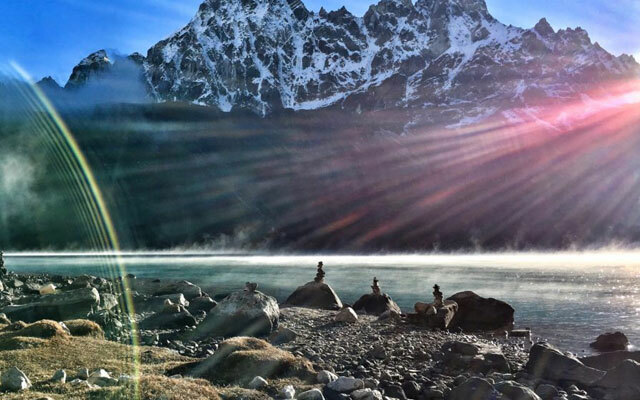 Gokyo lake with Renjola Pass trekking is another well-known trek in the Khumbu valley Everest region, which takes you to the remote border of Tibet. The route follows ancient trans-Himalayan trade between Nepal and Tibet has been taking place in caravan style through the trails of Nangpala pass. The Tibetan sellers walk all the way down to Namche bazaar with their home made stuffing and salt for doing their business. The trek highlights are fantastic view from high pass Renjola, the Goky Lake, Gokyo Ri, tropical Sherpa culture, monasteries and museums. End of monsoon season, when flowers pop out in Renjola, the trekkers get a mesmerizing experience around the Renjola Pass. 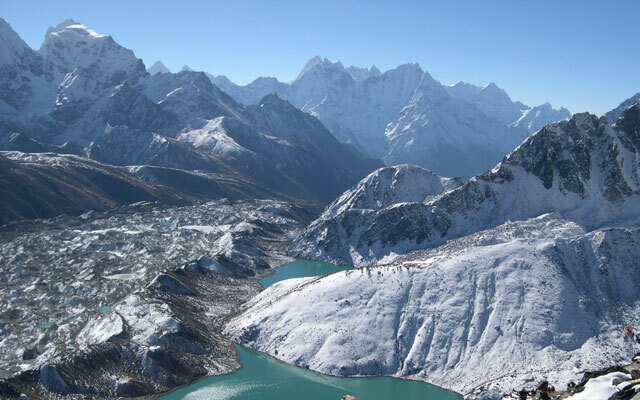 Gokyo trekking follows the highly praised trekking route through the Dudh Koshi River; the source the Gokyo Lake which is to the west of the Everest Base Camp, giving you the benefit to summit Gokyo Peak (5483 meters) offering a fantastic panoramic view of Cho Oyo, Everest and Makalu. A day hiking is recommended to our clients, bring hunt the fourth lake where Mt. Everest reflection on the Lake. Early morning climb Renjola top 4 hours where incredible view of Mount Everest, Lothse, Nuthse, Makalu, and Cho Oyu. After the pass all the way down to Marlung, Thame "the beautiful valley, and join into Namche Bazaar and Lukla. 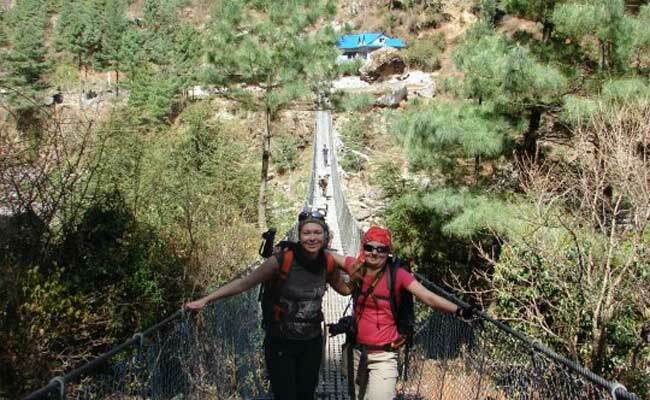 Either you can continue walk to Jiri 5/6 days or short flight to Kathmandu. This trek is possible to combine into Everest Base camp and continues trekking to Cho-la pass, Gokyo Valley and Renjola pass as you desire and interest so that giving itinerary is not as your interest, time frame let us know, we redesign another itinerary for you. Day 01: Trekking preparation day as well as arrival in Kathmandu meet our staff and welcome dinner, overnight at hotel (BB). Day 02: Kathmandu flight to Lukla and Phakding 2640m 3.30 hours, Overnight Lodge/Hotel (B/L/D). Day 03: Trek to Namche Bazaar 3440m 5 hours, Overnight Lodge/Hotel (B/L/D). Day 04: Acclimatization day, explore the Namche Bazaar, or Everest view point hotel and return to hotel (B/L/D). Day 05: Trek to Dole 4084m 6.30 hours, Overnight Lodge/Hotel (B/L/D). Day 06: Trek to Machharma 4450m 4 hours, Overnight Lodge/Hotel (B/L/D). Day 07: Trek to Gokyo 4791m 4.30 hours, Overnight Lodge/Hotel (B/L/D). Day 08: Climb to Gokyo Ri 5483m 2/3 hours & rest of the time enjoy Overnight Lodge/Hotel (B/L/D). 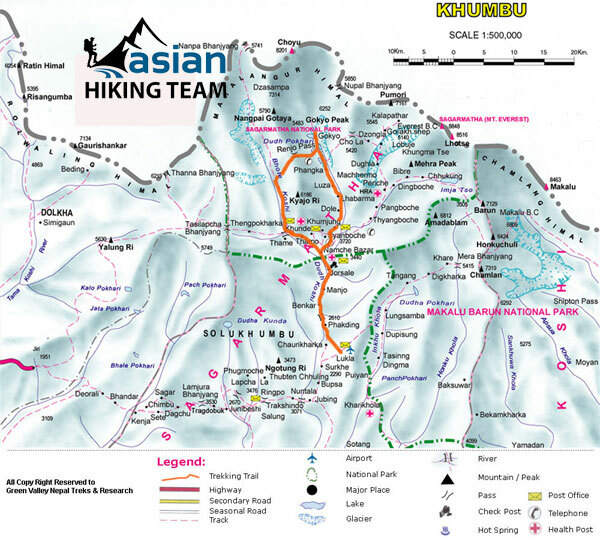 Day 09: Climb Ranjola Pass (5780m) and walk down to Marulung 4210m 6/8 hours, OvernightLodge/Hotel (B/L/D). Day 10: Trek to Thame 3820m 4/5 hours, Overnight Lodge/Hotel. Day 11: Trek to Namche 3440m 4 hours, Overnight Lodge/Hotel (B/L/D). Day 12: Trek to Lukla 2840m 6 hours Overnight Lodge/Hotel (B/L/D). Day 13: Fly back to Kathmandu and sightseeing in Kathmandu, Overnight Lodge/Hotel (BB). Day 14: Last minute, transfer to airport for your onward journey or next trip (B). Both way Domestict Air ticket to/from Lukla. Day 01: Kathmandu 1360m, transfer to hotel (BB). Arrival in Kathmandu airport, meet our staff then transfers to Hotel. Kathmandu is the colorful of Nepal, a fascinating blend of rational architecture and symbols of the twentieth century. It's artistic and cultural heritages is evident where ornately carried balconies mingle with beautiful shrines and temples. If you have time, we recommend that you check out Durbar square, home to the palace of Kumari Devi, considered to be a living goddess. It is also worth the climb to visit Swaymbhunath the monkey temple. Explore the network of street Markets and ally Bazaars and witness the burning Ghats at PashupatiNatha. For those with a few extra days in Kathmandu, the neighboring towns of Patan and Bhaktapur are well worth a visit too. Day 02: Kathmandu to Lukla and trek to Phakding 2640m 3.30 hours (B/L/D). Early morning, (40 minutes) flight from Kathmandu to Lukla (2840m). Meet our trekking crews'. After finish breakfast, to proceed from Lukla to Khumbu valley, head north, past a Chorten with praying wheels and join the main tail at Choplung (2696m) in less than one hour. The proceed head north crossing the Thado Khola (2554m) with the awesome trekking peak Kusum Khanguru (6483m). To reach Phakding (2640m), 1.30 hours from Choplung or almost 3.30 hours from Lukla. Overnight in Hotel in Phakding. Day 03: Trek to Namche Bazaar 3440m 5.30 hours (B/L/D). To cross the west bank (right) of the Dudh Koshi river, Continue through blue pine and rhododendron forests, pass a settlement if Metal worker (Tok Tok), village of Banker (2905m) with small lodge, see view of Mt. Thamserko (6856m) 1 hr. In the short while cross to the east (left) bank and climb up through Chumowa, cross the Khansar Khola to reach Monzo (2835m). Enter Sagarmatha national park here, 45 minutes from Banker. Descend in a cleft to the west (right) bank of Dudh Kosi on a suspension bridge to reach Jorsule (2774m) 30 minutes. Today we have early lunch at 11 O'clock. This is last village before Namche. After lunch proceed to cross Dudh Kosi (Bhote Kosi) again to the left side & again to cross the main Dudh Kosi, climb up till to Namche Bazaar (3440m), proceed in pine forest. We can see first view of Mt. Everest between Lhotse & Nuptse on the way to Namche. It takes 2 and half hours from Jorsule. Day 04: Namche Bazaar for Acclimatization rest day (B/L/D). Day 05: Trek to Dole 4260m 6 hours, overnight at hotel/guest house (B/L/D). Day 06: Trek to Machharma 4470 m 5 hours, overnight at hotel/guest house (B/L/D) . 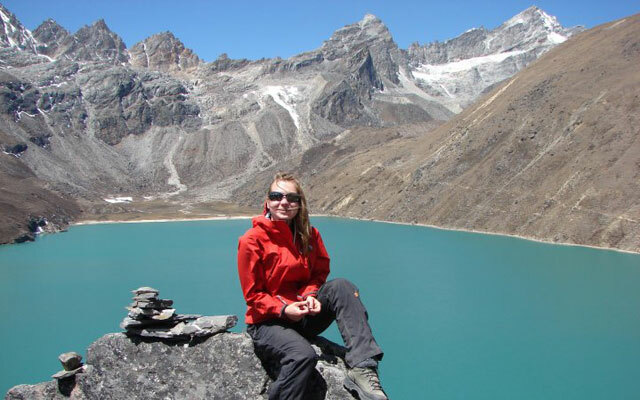 Day 07: Trek to Gokyo 4790m, 4.30 hours, overnight at hotel/guest house (B/L/D). Today the trek takes us at one of our final destination, Gokyo (4790m). We will start at 7.30 Am in the morning, passing through some basic tea shop and meet first lake, second and the last third lake where is small settlement call Gokyo. We have late lunch in Gokyo. Our hotel is nearby Lake. We will make this camp our base for 2 nights as we will have couple of sightseeing trips around Gokyo valley, Overnight at Guesthouse. Day 08: Trek Gokyo Ri (5483 meters) and then Back to Gokyo 5 hours and rest, overnight at hotel/guest house (B/L/D). Day 09: Trek over Renjola pass 5340m – Marulung 4210m 7-10 hours, overnight at hotel/guest house (B/L/D). 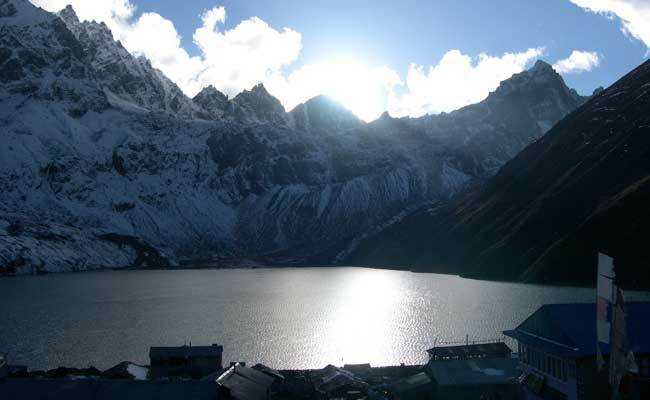 Start early morning after breakfast, follow on the right side of Gokyo Lake and start climb up. There is some rock climb before the top but the trekking path is very wide and steps. Now a day the Yak also carries the lodge over Renjola Pass in spring and autumn season. 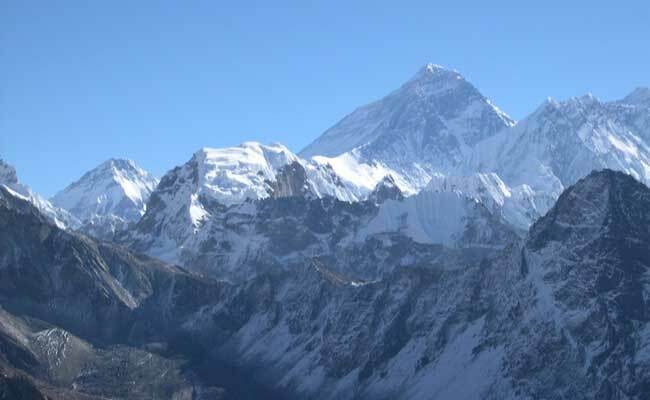 From top 5540m can see excellent view over Mt Everest and Makalu. After pass continues down to first lake, there are some steps and then gradually flat passing through the some pasture and steeply down to Lymrung where we have lunch and walk down to Marlung one hours more from Lymrung, 8 to 10 hours, O/N Lodge. Day 10: Trek to Thame 3820 meters 3.30 hours, overnight at hotel/guest house (B/L/D). Today is short day trekking to Thame so we start around 8 -9 O'clock. All the trekking is going gradually down. We will pass the stop place and some Chotan. The landscape and Mountain View is nice for picture. After 10 O'clock everyday wind comes. After your arrival in Thame 3820m 3.30 hours, we will bring you in the Monastery over the Cave. The monastery is very appealing to see and the one of the oldest monastery in this area, Overnight Lodge. Day 11: Trek to Namche Bazaar 3440m 4 hours, overnight at hotel/guest house (B/L/D). Today also have short trekking to Namche Bazaar around 4 hours so our lunch in Namche Bazaar after our arrival. The trekking bring you little down to cross Bhote Kosi and following alpine forest and the small Sherpa settlement call Thamo. You can see the huge hydroelectricity project which power share over Namche, khumjung and Khunde valley. It is also interest to explore. Day 12: Trek to Lukla 2840 meters 6 hours, overnight at hotel/guest house (B/L/D). Day 13: Fly to Kathmandu overnight at hotel/guest house (BB). Early morning flight back to Kathmandu, end your trip and free, shopping. Day 14: Departure or next trip (B).